I've been using foam core sticks since I started playing again 6 or 7 years ago. 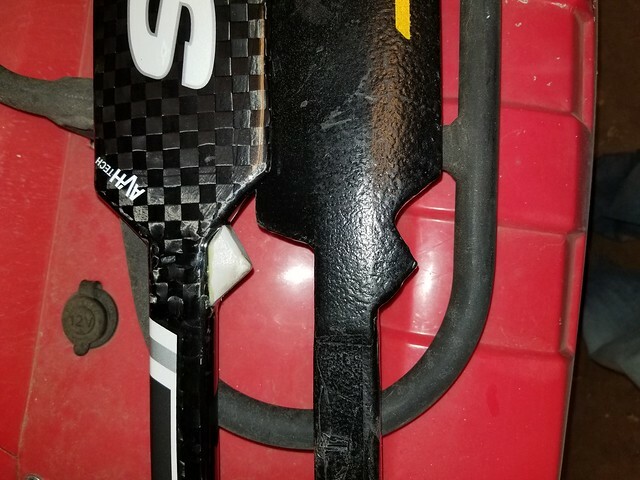 About a year or so into playing I found myself desiring more control of my stick, so I decided to modify the paddle of one of my foam core sticks based on a few mods I came across online. I ended up with a trigger grip/Lundy grip combo. It felt great in my hand and functioned exactly like I needed it to. Over the last few years almost everyone I know has transitioned to composite sticks and have come to prefer them over foam core. I've wanted to give a composite a try, but obviously my hang up has been the trigger grip. I just can't go back to using a normal stick. Over the last few months I'd been giving some thought to how I could make a trigger grip work. I've seen some people have successfully cut a trigger grip into composites, but I was really apprehensive as to how it would change the integrity of the stick. I got to comparing the top of a standard paddle to the trigger grip on my favorite stick and had an idea strike me. 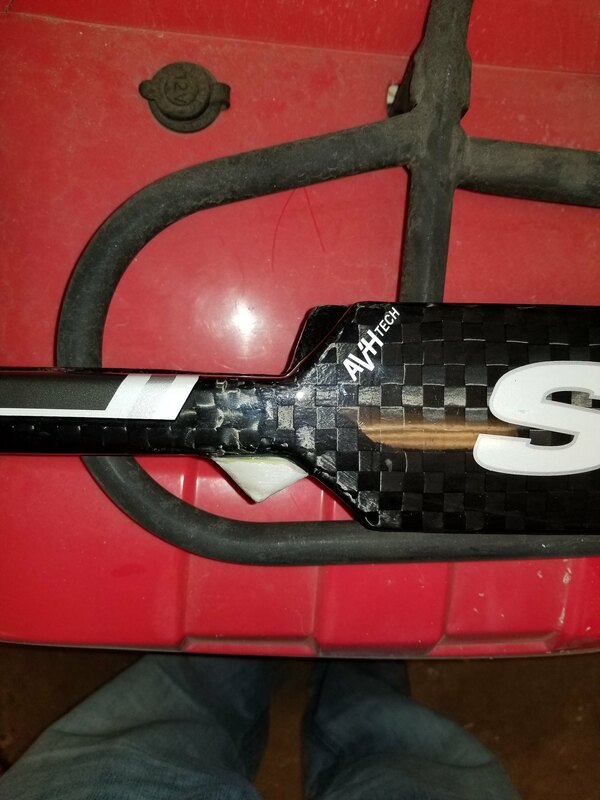 Buying a stick with a shorter paddle would allow me to add material rather than remove it. The Sherwood BPM150 deal at PHL that was shared on this forum was too good to pass up, so I grabbed one to give it a try. The stick showed up last week and I finally had an opportunity to try my modification. My initial plan was to shape piece of wood for each side and use VHB tape to adhere it and then tape over it to cover any edges or seams and add a little more strength. Then I remembered I had a spare fish finder transducer mount made of 3/4" thick high density polyethylene, something that would shape a little bit slower so I wouldn't have to worry about taking off too much material too fast while doing the final shaping. I also decided to go with epoxy rather than the VHB tape for a bit more of a sturdy bond. After shaping and test fitting the trigger piece I decided against adding anything on the opposite side of the paddle to replicate the Lundy grip. I'm going to try it without first, as it may not be necessary. The epoxy filled the gaps really well. After doing some final shaping with a dremel I heated the plastic with a lighter to smooth the edges a bit. 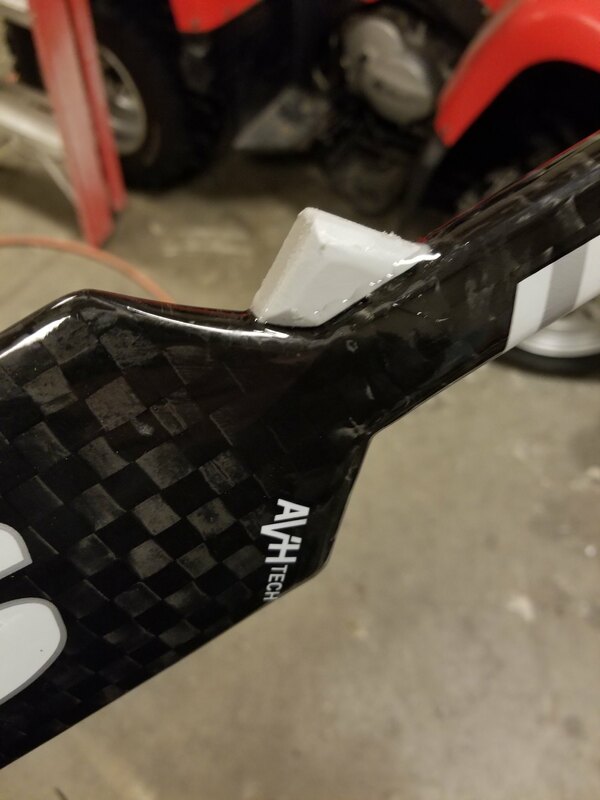 The grey plastic matches the color pattern of the stick so I decided against taping over it as I prefer a smooth grip. I am going to try it out tonight at drop in hockey. Great job! I’ve never seen someone add something to the paddle of their stick so this is a first. Got a chance to give it a try today, held up just fine. The grip itself felt just like my other sticks, so that's great. I used grip tape, but think I will ditch it in favour of regular tape. The stick itself is going to take a bit of getting used to, everything comes off it so lively. Defenseman sent a couple passes back to me and I had trouble catching them, both bounced off my blade. Passing the puck was accurate and had better velocity than my foam cores, which is promising. I've sucked at passing/playing the puck for years. I've made a getting better a point of emphasis this year and finally found a bit of an unusual technique that works for me.